When summer is well under way this recipe is perfect to pull out for the BBQ. 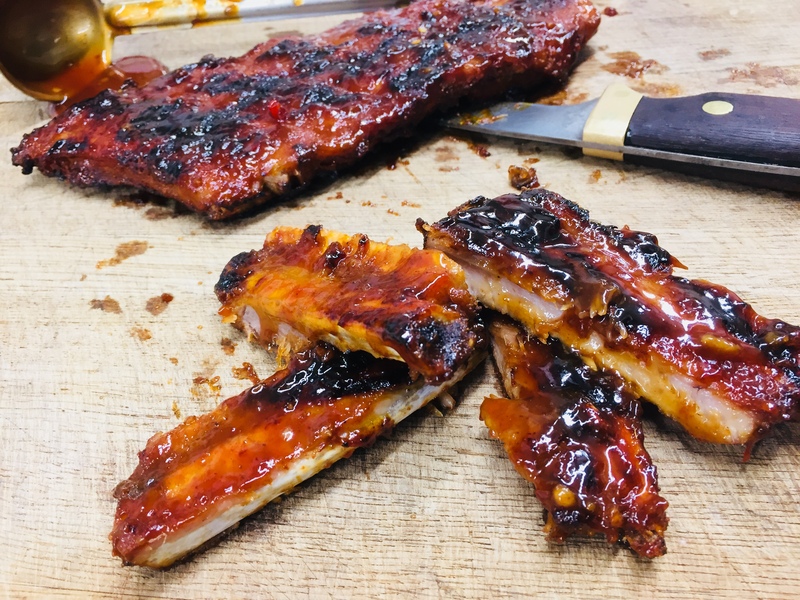 To get prepared ahead of time you can make the BBQ sauce and the dry rub beforehand and even go so far so pre-cooking the ribs. Once you’ve got everything ready you’re free to enjoy some beers and just throw the ribs on the BBQ and baste with the sauce once you’re ready to serve. Don’t worry if the sun isn’t shining though, you can still make this in the oven and if you don’t have time to go running round the hills then this recipe will work just fine with ribs from the supermarket. Mix together the dry rub ingredients and rub all over your ribs. Wrap up in baking paper then tin foil and bake at 165C for 1hr 15mins until tender. Make sure there is a good seal on the foil so that the ribs retain all their moisture and don’t go dry. Combine all the ingredients in a pot and simmer over a low heat until reduced by about 1/3 and nice and syrupy. Once the ribs are cooked brush them with the sauce and either grill on the BBQ or roast in a hot oven. Turn and brush with the sauce until they are nicely glazed, sticky and browned.